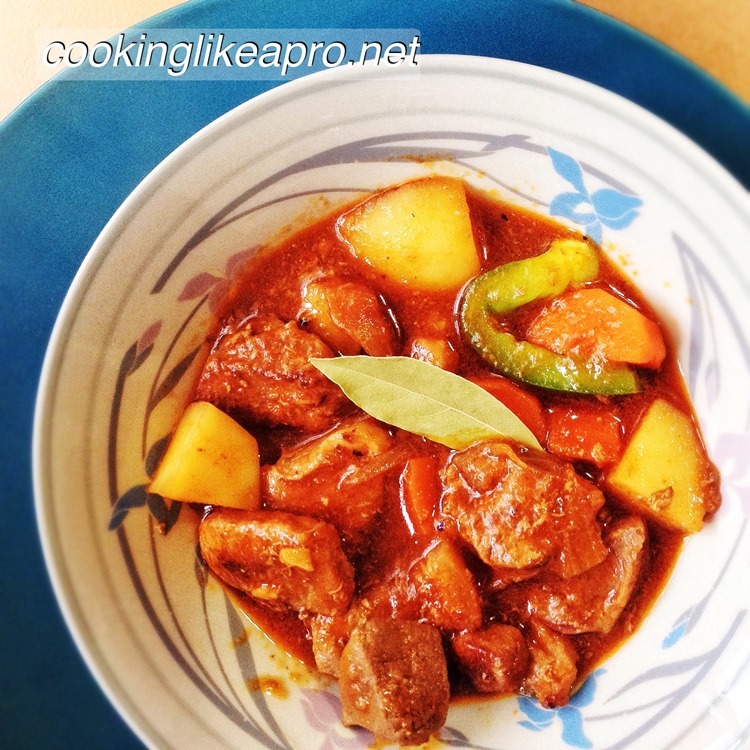 Pork afritada, another Filipino recipe, is a tomato-based dish. It’s cooked with carrots, potatoes and bell peppers, like many of our tomato-based foods. With that, pork afritada has a lot of similarities with the menudo, mechado, and even the kaldereta. There are bits of differences in flavor and ingredients; but the manner of cooking, the same. Afritada may also be cooked with chicken (chicken afritada). The ingredients are exactly the same. With chicken though, cooking time is a bit faster. If you have chicken instead of pork at home. You can follow the same recipe. Only, cut the frying of the meat by about 10 minutes. Now, here’s how I cook my pork afritada recipe. I always have carrots, potatoes and bell peppers stacked in the fridge. There are just so many Filo dishes you can cook with them. I used Colway tomato sauce. I find it very strong and tangy so I cut used 1/3 cup. If you have Hunt's or Del Monte brand, you may adjust it to 1/2 cup or even to a cup. Remember to always trust your taste buds! 1. Put oil in a heated pan. 4. When the onions sweat and wilt, put in the pork. 5. Cook the pork for 20-30 minutes. Season the pork with 1 tbsp fish sauce. This step takes the longest time. When done properly, you’d get a very tasty dish at the end. You want the meat a bit charred; but not to the point of being burnt. Stir after every 10 minutes. Make sure that the pork is fried well under the heat. Just take your time and do not burn your pork. 6. Put in the tomatoes. Stir well. 7. Add in the pork liver. Stir for 2-3 minutes. 8. Just when the liver changes color, put in the water and the tomato sauce. I don’t want my pork liver to be overcooked and tough. To do this, I make sure that it has cooked first; then, I immediately add water so it remains soft when eaten. 9. Add in the carrots and potatoes. 11. Cover the pan. Let it simmer for 20 minutes to allow the meat to tenderize. 12. Stir occasionally (every 10 minutes, or so) to prevent burning the bottom of the pan. 13. When the meat is tender enough, season with additional fish sauce, salt and pepper. 14. Add in the bell peppers. 15. Turn off after 3-5 minutes. I hope you enjoyed this one. Yummers! !